Robert Hansen makes fine art prints using many different archival printing methods depending on the subject matter and what best portrays the original vision and emotion of the scene. Listed below are the various printing methods and materials that he uses. Please understand that no computer screen can begin to duplicate the beauty and subtlety of these prints—they truly must be seen in person to be believed! Each print is personally custom-made to your order. It is sized proportionally at the long dimension, signed and edition-numbered, hinge mounted, and over- matted on 4-ply archival museum rag board. The finished product is accompanied by a certificate of authenticity signed by the artist. This process was invented in the late 1800’s. It involves using Platinum and Palladium metals combined with a sensitizing agent coated on archival watercolor paper and contact printed with the photographic negative to arrive at a positive print. This beautiful, full tonal process was a favorite of the early pioneers of photography including Edward Weston, Alfred Stieglitz and Frederick Evans. When used with the appropriate subject matter it results in an ethereal, full tonal image that conveys the emotion of the original subject better than any other printing method. It was only after the metals became hard to obtain during World War I that Edward Weston began to explore glossy gelatin silver papers. 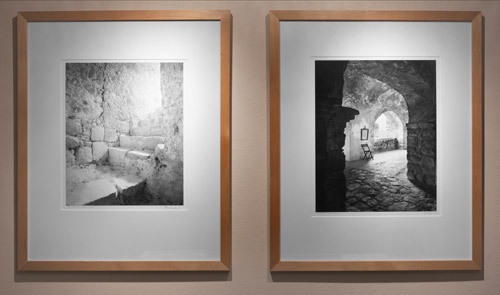 Robert has used the platinum/palladium printing method for many of his Yucatan Passages images. Many of Robert’s original Mexico negatives are made with an 8x10 view camera and are contact printed on Arches watercolor paper. This classic process is made even more rare by the scarcity and price of the Platinum/Palladium metals. Each image printed with this method is a one-of-a-kind print although it is editioned at 25 prints per negative. The gelatin silver printing process is the most widely recognized photographic process used by the west coast school of photographers including Ansel Adams, Edward Weston, and contemporary photographers Ray MacSavaney, Bruce Barnbaum, Craig Richards, and many others. This process involves projecting the Black and White negative down upon a sensitized, coated piece of photographic paper and developing that paper in various developer solutions. This process results in a sharper/higher contrast image and negatives can be enlarged beyond their original size. Robert's Anasazi Indian Ruins / Rock Art images, shot with an 8x10 view camera, are contact printed or enlarged on Gelatin Silver papers to reveal sharpness and tonal contrast. Color Pigment prints are made by digitizing the original 4x5 photographic transparency (or working from an original digital file) and printing the image using an Epson 9800 Pigment printer. The inks used on this printer are designed to be non-fading and last from 100 years and longer depending on the print surface. The digital workflow allows for extremely precise artistic control over every detail of the finished image, and the pigment print method of making photographs is by far superior to the older wet process color methods (except for dye transfer). Robert uses heavy weight Ilford Premium Luster paper for pigment prints in the Color Landscape portfolio and 200gsm textured fine art watercolor paper for prints in the China Lake, Transportation/Trolley, Mexican Color, and Architectural Fine Art portfolios. The varnished pigment print (brown-tone) process was discovered by Robert by applying a special varnish to the original pigment prints. This varnish deepens the contrast and gives a two-dimensional feel to the print. It is also considered to be a unique process in that each print made from the original negative will be different. These differences bring excitement and originality back into the printing process when older negatives are reprinted. Selected images of Robert's Yucatan Passages portfolio are produced using this process.